Bring the flexibility of networks into Pipeline Pilot. With the Discngine Network Collection you can represent, manage and analyse complex network structures using advanced graph theory. The collection Includes capabilities such as clique detection, shortest path identification and the merging/unmerging of sub graphs as well as the ability to export subnetworks to popular visualization tools like GraphViz, Cytoscape and Gephi. Creation: represent any Pipeline Pilot record as node and / or edge in directed, undirected or mixed property graphs. Manipulation: advanced graph manipulating algorithms such as union, intersection, inversion, and disconnected sub-graph extraction. Algorithms: apply shortest path & minimum spanning tree calculations, articulator detection and importance measures. Mining: perform sophisticated graph traversals and explore the neighborhood of your key entities. 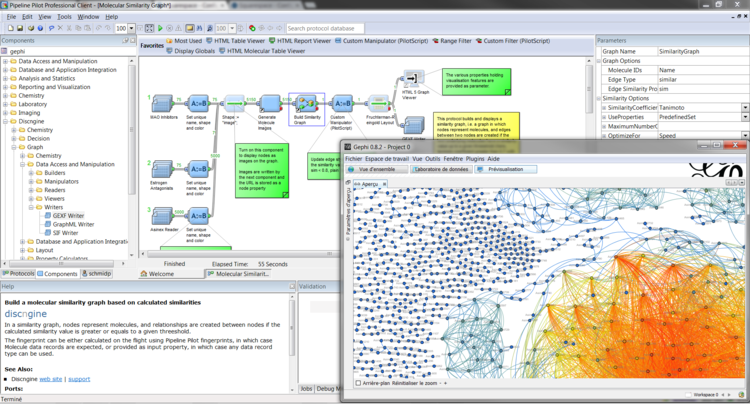 Visualization: create advanced visualizations using GraphViz, Cytoscape Web or external desktop tools such as Cytoscape. Thank you for your interest in Discngine Network Collection!